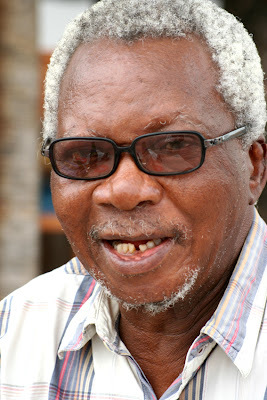 We managed to find JP Clark-Bekederemo, arguably Nigeria's best-loved and most famous living poet. We met with him at the Lagos Motor Boat club for drinks. At 74, he is still going strong. He is currently working on an 8-part documentary series on the Ijaws. A strong political contestation drives him yet onwards. I'd like to have as much passion and conviction when I'm his age..
We read this poem as we travelled around Yorubaland (more poems here). About our roomlet and floor. To where the others lie. They must scurry in to hide. We will settle to sleep of the innocent and free. Wow, brings back great memories of reading his work back in NNSS Abeokuta in the early to mid 1990s. Shame how we don't recognize and acknowledge the truly powerful ones amongst us- this man's writing could have(well, could still)invigorate and inspire generations. BTW, a true disciple of Nigerian literature who doesn't know J.P Clark, or his work has some work to do! Btw, you guys seem to be having a lot of work (fun) to do. Wouldn't mind being in your shoes (not exactly Fela's)! 'Okunrin meta you don't even have to be a disciple of Nigeria literature...any Nigerian not familiar with J.P. Clark has some work to do. This is an exquisite poem, and I thank you for sharing it. I'm particularly drawn to the lines. i love your love for nigeria, which can't be said for so many of our own. by the way wetin you do mr olu oguibe? he sounded real antsy. I ve always loved it from since. Plus I love the comeback posts..
John Pepper Clark-Bekederemo inspired me. Poems like this one rite here,the Casualties and the two Abikus(one from Clark & the other from Soyinka)reminds me of what was good about my secondary school days.This is the kind of poem that would remind one of William Wordsworth definition of poetry as "a spontaneous overflow of emotions recollected or captured in tranquility". This poem reminds me other the other poems we read at the time:Night Fall in Soweto,An Irish Airman Forsees His Death,etc.